The body of the tar is in the shape of a double bowl carved from mulberry wood, with a thin membrane of stretched lamb-skin covering the top. 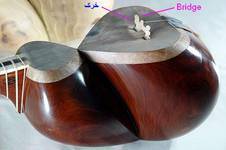 The smaller bowl is called “Naqareh” and the bigger one “Shekam”. 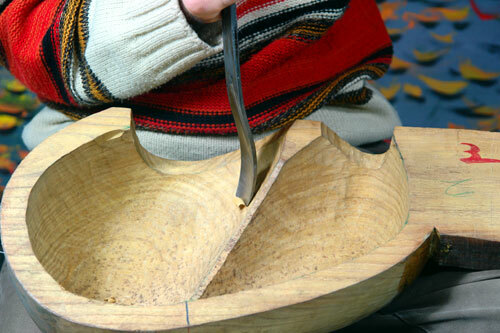 After putting together the two halves of the bowl, the neck and then the Sarpanje or peg box will be added to them as well. There are two kinds of peg box for the tar, the traditional one and the new one designed by Master Qanbari Mehr. The length of the neck is 45 to 50 cm, and it is usually decorated by two parallel rows of bones with a dark wooden ribbon between them. In recent years, some bridges are made out of plastic. The tar can be tuned in different ways. However, some tunings are more preferable than others for especial dastgahs. The range of the tar is almost two and a half octaves. 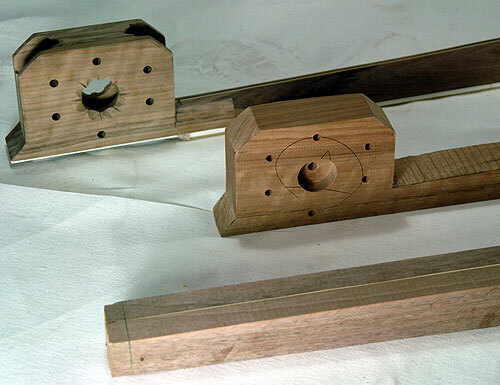 The fingerboard has twenty-five to twenty-eight adjustable gut frets. These frets indicate the location of the notes and made of the sheep gut. The tar is played by a plectrum which is usually made of brass with the length of 3 cm. The half of the plectrum is covered by wax so that the player can hold it easily. 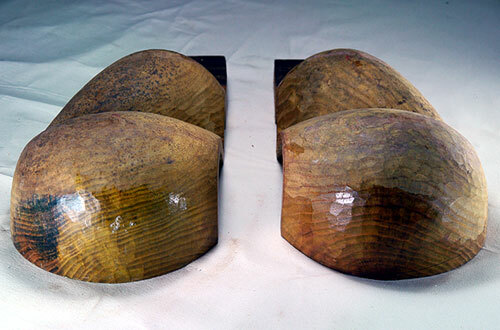 Recently some plastic plectrums have been produced too. Some of the famous tar makers of the previous generations are Khachik, Hambarson, Farajollah, Aqa Goli, Yahya, Shahrokh, Malkom, Abas and Jafar. Among these people, Yahya is the most famous one. 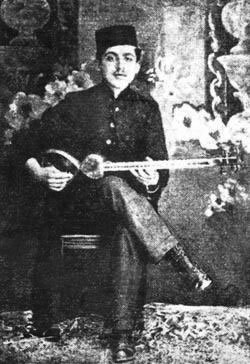 Hovans Abkaryan was an Iranian Armenian from the city of Esfahan. He signed his tars with the surname “Yahya”, and because of this he is known as Yahya among people. Apparently, he died in 1931. 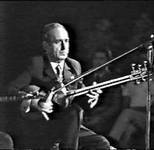 For the Iranian musicians a good tar is always compared with that of Yahya. Some of today’s well-known tar makers are Mahmud Farahmand, Yusef Purya, Ebrahim Barzi, Arjang Naji, and Ramin Jazayeri. 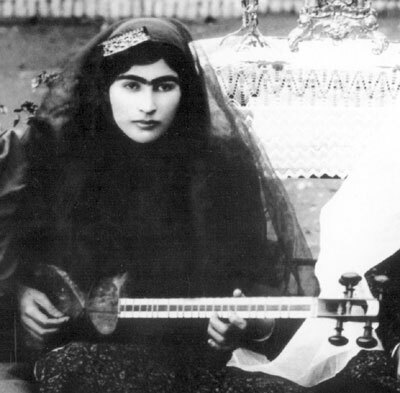 This style was prevalent in the Qajar period. 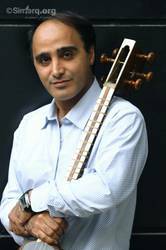 Among the most famous people playing in this style we can refer to the Farahani family. It seems that up to 1921 the tar was held on the chest, but later it was brought down and was put on the legs. Also, some changes occurred in its structure. 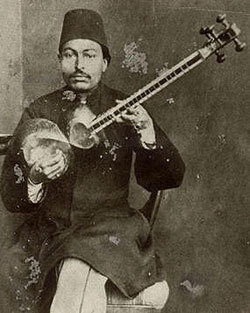 There are some recordings left from the two great masters Mirza Abdollah and Mirza Hussein Qoli Farahani. 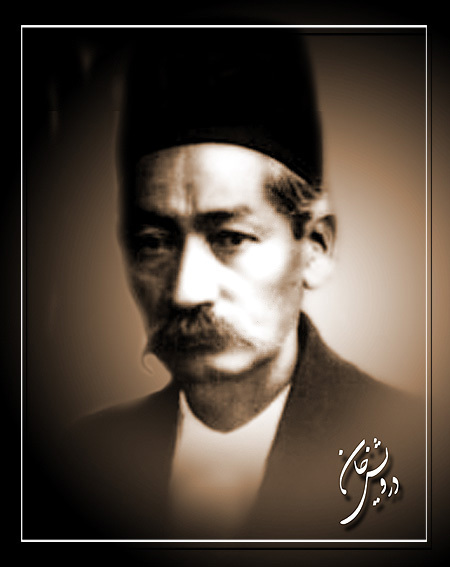 Another famous figure in the traditional style was Darvish Khan. He was a student of Aqa Hussein Qoli. He was also a very talented composer and composed beautiful and uplifting pieces which are still the source of inspiration for many musicians. He was also familiar with western music since he played the percussion in the Army Music School for a while. He also composed some pieces like march and polka. 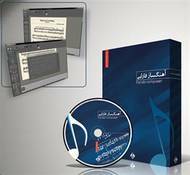 Moreover, some of Darvish Khan’s recordings are accompanied by the piano. All of these are evidences showing the influence of western music on him. After Darvish Khan we can name some virtuous tar players like Musa Marufi, Morteza Neydavood, Colonel Vaziri, and Yahya Zarin Panjeh. 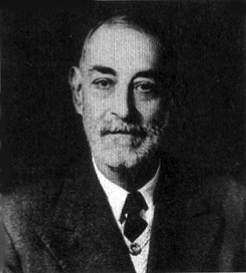 Ali Akbar Shahnazi was the son of Aqa Hussein Qoli Farahani. 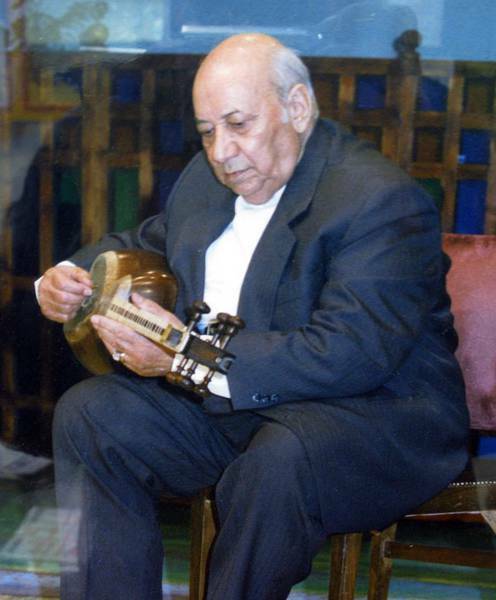 He was one of the most important figures in transferring his family musical tradition to the younger generation. His style of playing was very unique, completely different from those of the past and present. There were also some fine tar players whose styles were not really appreciated at the time they lived, but the next generation did praise them. Their style was more personal; however, it would be fit in the framework of the Traditional style. Qolam Hussein Bigje Khani was one of them. He would play the tar very fast and had his own musical utterance. The 1970s is known as the renaissance of the Persian art music. In this period the Center of preservation and Promotion of Persian Traditional Music was established. In this center the old masters who were the students of the masters of the Qajar period taught the new generation. Therefore, the traditional style which was not heard for a while and was very different from the Radio and new style was revived again. 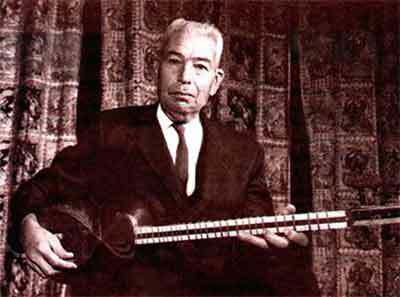 Mohammad Reza Lotfi, Hussein Alizadeh, Dariush Tal’i, Ata Janguk and Dariush Pirniyakan and from the younger generation Arshad Tahmasbi are some of those who studied with the old masters and created a new style of the tar playing based on the Classical tradition. 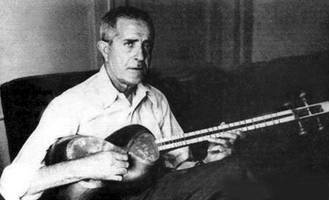 Colonel Ali Naqi Vaziri was one of the most virtuous Iranian tar players. 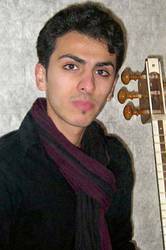 He learned the tar from Aqa Hussein Qoli and Darvish Khan, and later he went to Europe to study western classical music. Beside the tar, he played the violin and piano too. 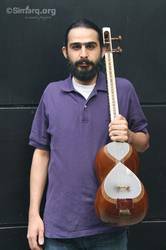 By returning to Iran, he created a new style for playing the tar which was totally new and unique. The fast tremolos, arpeggios, passages, and usage of chords were some characteristics of his style. Although Vaziri's influence was very dominant in the scope of education, his style of playing solo was not followed by many at his time and the generation after. 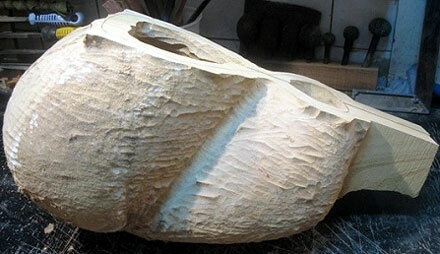 However, Kayvan Saket followed Vaziri’s style almost after fifty years. 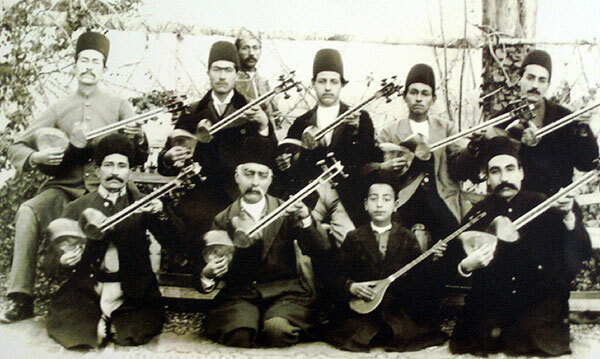 When the Iranian National Radio was established in 1940, some musicians entered this organization and gradually a different style of playing the tar took shaped which came to be known as the Radio style. In this style, the players were more concerned about their own personal feelings and moods rather than the radif. Also, in this style, the technique of playing was very different from that of the Classic one. In the radio style one would not hear a single strong pick. Also, the tremolos were slower and the musical sentences were clearer. 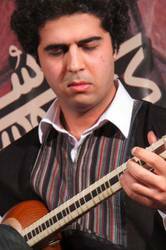 Some of the tar players of the radio style are: Abdol Hussein Shahnazi, Jalil Shahnaz, Lotfolah Majd, Farhang Sharif, Feraydun Hafezi, Mehdi Takestani, Ebrahim Sarkhosh, and Hushang Zarif. 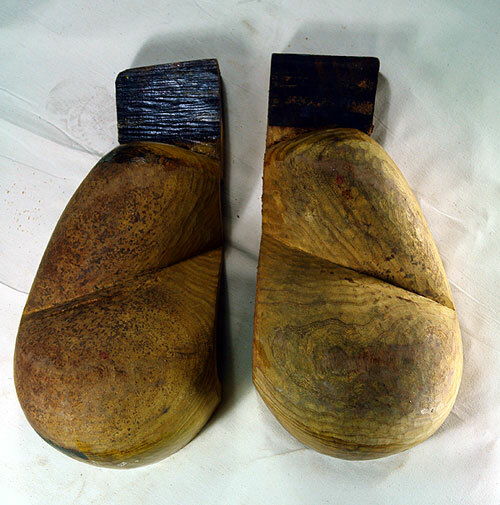 There are some other tar players who initially studied the traditional style, but they have been also influenced by other styles including folk music traditions. Majid Derakhshani, Hamid Motebasem,Davood Azad and Mohsen Nafar are some of them. The tar has been the most popular instrument in the last one hundred years. 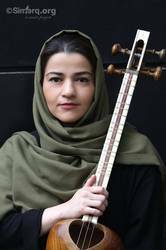 Therefore, unlike some other instruments like the ney, kamanche, and even the santur which did not have some players in some parts of the history of Persian music, there have been always abundant tar players throughout its history. 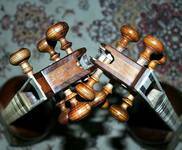 Even the expensive price of this instrument has not affected the numbers of those who loved to play the tar. Between 1941 to 1961 when most of the orchestras were using Western instruments like the clarinet, flute, piano, and the members of the violin family instead of Persian instruments, the tar was the only Persian instrument which was utilized in those orchestras. In fact, the attracting sonority of this instrument has been the main reason for keeping this instrument so live and influential throughout history. Also, the number of the professional tar players in the present time is greater than the past. Some of today’s skilled tar players are: Shahriyar Faryusefi, Kay Khosro Purnazeri, Zaydolah Tolo’i, Farokh Mazhari, Mehrdad Delnavazi, Shahram Mirjalali, Mohammad Jamal Samavati, Hamid Sokuti, Mansur Sinaki, Siyamak Nemat Naser, Afshin Faramarzi, Jahansh Sarami, Bahram Saed, Behruz Hemati, Homayun Yazdani, Hamid Khabazi, Vahid Basam, Erfan Ganje’i, Ali Qamsari, Payam Jahanbani, Iman Vaziri, Emad Hanife, Arjang Sayfizadeh, Salman Salek, Padideh Ahrar Nejad, Hasan Amin Sharifi, Sanaz Satarzadeh, Amin Ramin, Maziyar Shahi, Tahmures Purnazeri, Meqdad Shah Husseini, and many other. 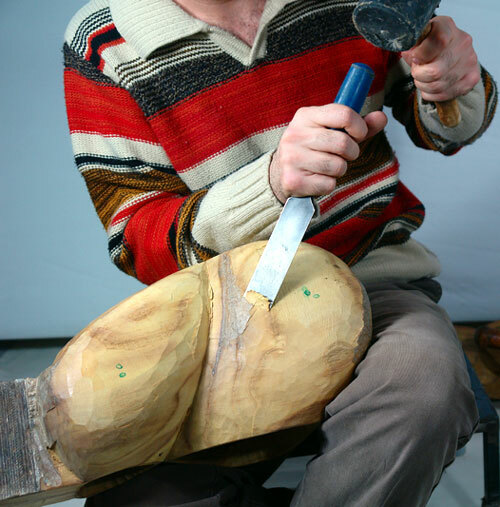 Since the tar is a relatively new instrument, it does not have really related instruments. However, Colonel Vaziri invented two different kinds of the tar, the bass tar and the soprano tar. The idea was taken from the western classical musical tradition with which he was familiar. 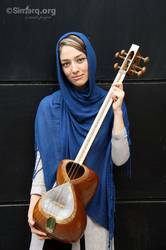 However, only the bass tar was accepted by the Iranian musicians and has been used in ensembles. The range of the bass tar is one octave lower than the tar, and it is played by a plastic plectrum. 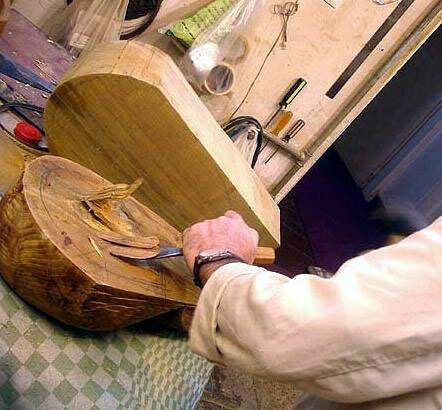 The bass tar has only three strings which are usually the strings of the guitar or the cello. Also, the Naqare part of the bowl in the bass tar is not covered by skin. The bass tar is only used in ensembles and orchestras not as a solo instrument. 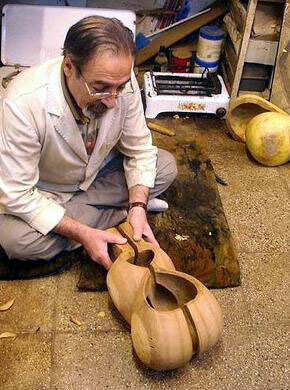 Azerbaijan is the only province of Iran in which a local tar is played beside the Persian tar. In the history books and documents, this instrument is called “the Qafqazi tar”. 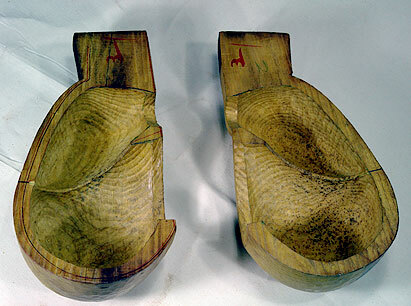 Like the Persian tar, the Azeri tar’s sound box consists of two bowls. 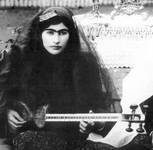 The Azeri tar has eight strings and is held on the chest of the player. Therefore, its player stands up while playing the instrument. The sound of the Azeri tar is nasal. 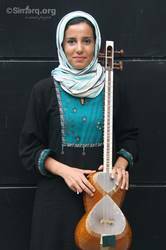 The tar is one of the main instruments of the Persian art music and it is played both in ensemble and as a solo instrument. 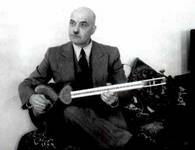 The sound volume of this instrument is comparable with those of the santur, ney oud, and kamanche and can be played without using a microphone. Beside its usage in the Persian ensembles, the tar has been played in orchestras. Also, many pieces were written for a tar ensemble as well as the tar and the different kinds of orchestra. For example, a fantasy for the tar and the string orchestra is a piece for a tar and a string orchestra. 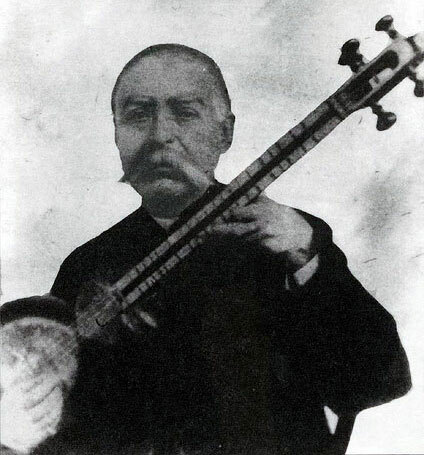 This piece was originally written by master Vaziri for a tar and is known as “Bandbaz”. 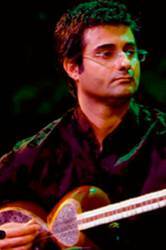 Hussein Dehlavi rearranged this piece for the tar and the string orchestra. 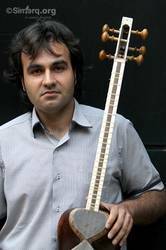 Mohsen Nafar wrote a piece for an ensemble of tar. In this piece different melodic lines are played. 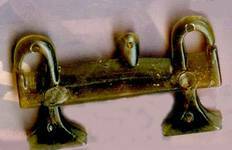 Although the tar is an urban instrument and did not exist in the regional music of Iran, by the establishment of the Radio some folk musicians have used this instrument. 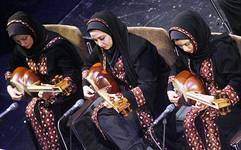 On the other hand, some Persian classical musicians have used the tar in playing the folkloric melodies. Playing the masterpieces of the famous western composers by the tar is another experience. 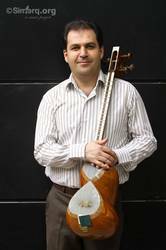 Such an experience was done first by some musicians in the Republic of Azerbaijan and was later adopted by the Iranian musicians. Theses pieces were written originally for the piano, violin, and guitar. 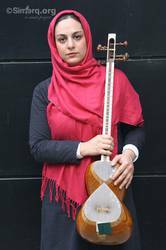 And, of course, performing them by the tar is just experimental and is not considered a new style in the scope of the Persian art music.